In 2014, Robert Savu and Dragos Motica created Ubikubi. The collaboration was a spontaneous one, but is based on a successful relationship prior to the origin of the brand. Before the creation of Ubikubi, Savu and Motica shared mutual experience in various projects they co-worked on. The resulting brand is the combination of both founders’ visions. 223,00 € Delivery: 3-4 weeks. 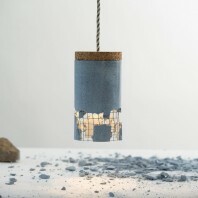 Slash “/” Lamp: an object that gives a subjective and personal choice Incredible pendant lamp in raw material, cork and concrete, where the choice is up to you to let the lamp as delivered or to smash it until it fit your design need. It is suitable for both residential and public spaces, creating a special lighting effect over any surfaces. The main concept behind Ubikubi, as well as the practical element, is directly associated with Savu’s previous experiences. Motica, on the other hand, can be described as a zealous architect and designer of many talents. He contributes the creativity, rationality, harmony, and steadiness to Ubikubi. For the pair, Ubikubi is about more than just design. It also includes manufacturing. The partners’ goal is to develop user-friendly, basic, and environmentally friendly products. These showcase the organic appearance of the materials and rely on internal prototyping and manufacturing as fundamental components. Romanian in origin, Ubikubi sets out to develop logical, modern products. Basic yet beautiful. Practical yet astounding. Qualitative yet attainable. They own the entire process from design, to development, to production of the product. Ubikubi joins inspired craftsmanship with new techniques and fresh design. 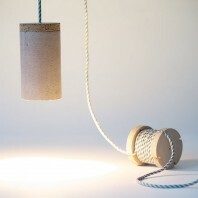 Ubikubi’s lamps and other products are able to adjust to different materials, sizes, and colours. This depending in the unique requirements presented. The brand is continuously on the look out for organic, authentic, and basic materials, along with more sustainable resources and production methods. Ubikubi’s lamps and other products are created from robust, aesthetic materials, always bearing the effect on the environment in mind. Ubikubi believes in the smart use of material and technology with the aim of efficient functionality. Basic and adaptable, Ubikubi’s products enable easy-going installation and can be included in any interior space. It’s functional yet impulsive.